Objective: Very low birth weight (VLBW) preterm neonates are fed every 2 hourly (2H) or 3 hourly (3H), but there is not sufficient evidence to determine the best feeding schedule. 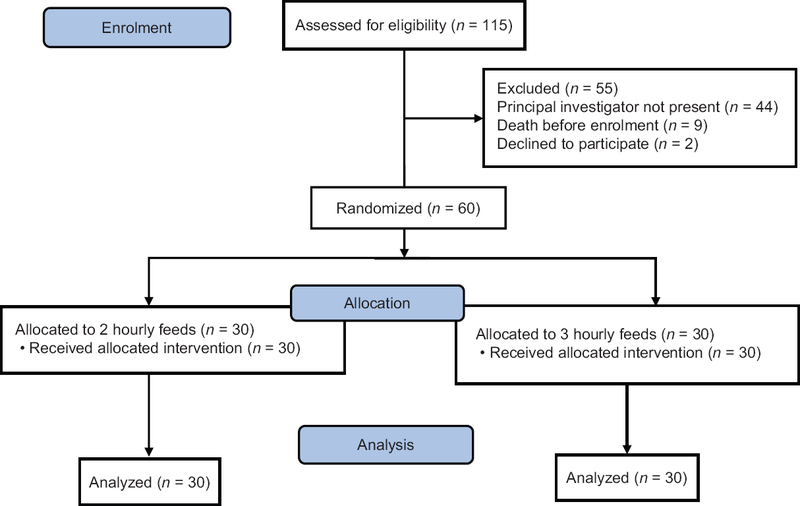 The study objectives were to compare the effects of 2H or 3H feeding schedule in neonates weighing <1500 g at birth, on the incidence of feed intolerance, apnea, necrotizing enterocolitis (NEC), hypoglycemia, and time to attain full feeds. Design and Setting: This longitudinal observational study was conducted in a level III neonatal unit of a teaching hospital in North India between October 2012 and March 2014. Materials and Methods: All stable intramural neonates born <1500 g were eligible for the study. Neonates with major malformations, congenital heart diseases, gastrointestinal anomalies, and those contraindicated for enteral feeding as decided by the treating clinicians were excluded. Sixty VLBW preterm neonates were assigned to 2H or 3H feeding groups. The incidence of feed intolerance, apnea, NEC, hypoglycemia, and time to attain full feeds was assessed. Results: There was no difference in incidence of feed intolerance between the two groups (30% vs. 23.3%, P = 0.56). The incidence of apnea, NEC, hypoglycemia, and time to attain full feeds was also similar between the two groups. Conclusion: 3H feeding is possibly as good as 2H feedings for VLBW neonates. Background: The debate about the best arthroscopic technique for the anterior cruciate ligament (ACL) reconstruction surgery using semitendinosus (ST) quadruple graft is still unresolved. The aim of the present study was to compare the results of arthroscopic ACL reconstruction surgery techniques (transtibial [TT] and anteromedial portal [AMP]) using ST quadruple graft in terms of functional outcome. Materials and Methods: A total of 50 male patients with ACL tear were operated using the arthroscopic technique. 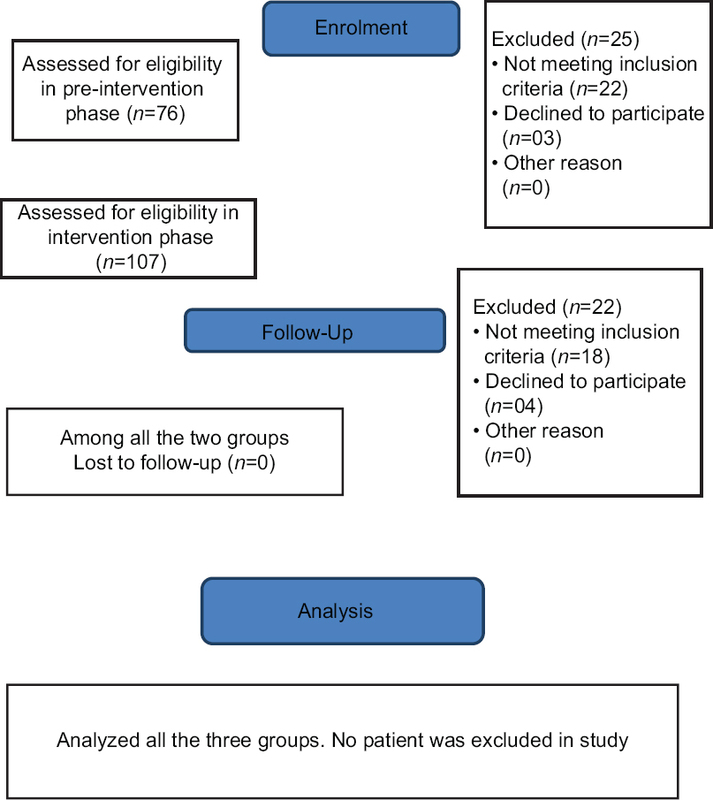 The patients were divided into two groups (TT group and AMP group) and studied prospectively. The TT group (n = 24) included the patients in which femoral tunnel was prepared using the tibial tunnel. While the AMP group B (n = 26) included the patients in which femoral tunnel was prepared through the anteromedial arthroscopic portal. All these patients were assessed regularly and at follow-up of 1 year functionally using Lysholm Knee Score. Two groups were matched in terms of age, mode of injury, and side involved. Results: The average age of the patients in Group TT and AMP was 31.2 years (range: 22–43 years) and 30.6 years (range: 21–45 years), respectively. The mean Lysholm score improved significantly (P < 0.001) from 55.19 (range: 38–66) preoperatively to 82.65 (range 69–100) at the final follow-up in Group TT and 53.54 (range: 38–66) preoperatively to 82.04 (range: 59–100) at the final follow-up in group AMP. However, there was no significant difference in the mean Lysholm score while comparing the two groups at the final follow-up. Conclusion: ACL reconstruction surgery using ST quadruple graft with TT and transportal techniques provide similar functional outcome at 1-year follow-up. Background and Aim: Continual contact with musical instruments may cause distinctive skin conditions among musicians. The site and degree of contact with the instrument may determine the type of presentation, further influenced by the amount of time spent in training. These conditions may be severe enough to even compromise musicians' careers. Since data on the subject are lacking in India, a study was conducted to assess the frequency and factors associated with the occurrence of instrument-related skin disorders among musicians in a military band. Materials and Methods: This was a cross-sectional study. A universal sample comprising all the members of a military band was included. A total of 162 musicians were evaluated using a questionnaire that included questions related to age, instrument played, current skin disorders, and the impact of skin symptoms on music making. 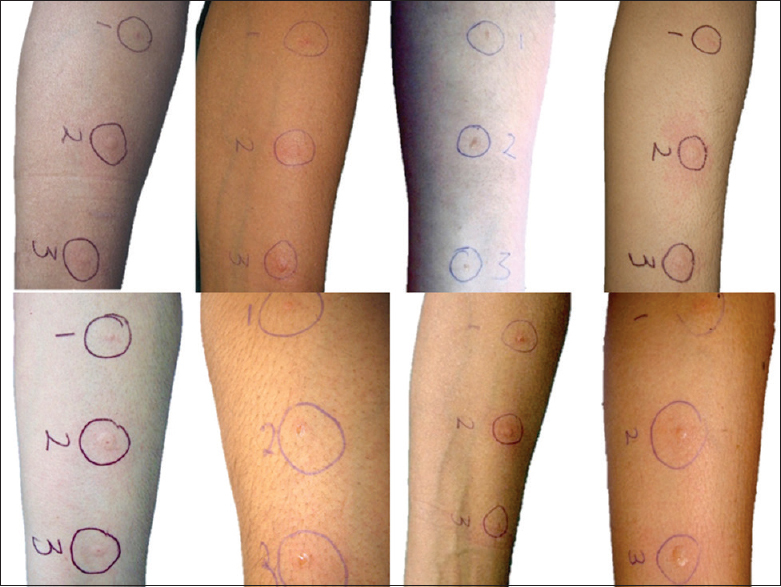 Dermatological examination was done for all the participants. Statistical Analysis Used: Mean, median, and frequencies; Pearson's Chi-square test. Results: Of 162 musicians, 49 (30.2%) had at least one skin disease not correlated with instrument playing. Instrument-specific dermatoses were found in 55 (34%) of the 162 musicians and correlated with years of experience and the time spent in musical activity. Conclusions: Wind instrumentalists had the highest risk of developing skin problems. The occurrence of the tear trough deformity and lip dyschromia correlated significantly with the playing of a wind instrument. The impact of vibratory stress of wind instruments on the facial tissues needs further inquiry. Although not life-threatening, instrument-specific dermatoses may lead to impaired performance, occupational risk, and cosmetic disfigurement. Background and Aim: Upsurge in usage of latex gloves over the last few decades, coupled with the proliferation of medical latex products at the workplace, has led to a higher incidence of latex-related symptoms among health-care workers (HCWs). This study aimed to assess the prevalence and associated factors of latex glove-related symptoms and sensitization among HCW at a multispecialty hospital. Materials and Methods: The study included all the paramedical personnel and nurses employed at a multispecialty hospital where powdered latex gloves were in use. Consenting participants were evaluated by a questionnaire for symptoms of latex allergy, followed by a skin prick test (SPT) for evaluating sensitization to latex allergen. Statistical Analysis Used: Mean, standard deviation, and Student's t-test were used for continuous data. Categorical data were analyzed using the Chi-square test. Odds ratios and 95% confidence intervals were calculated. Results: Latex glove-related symptoms were present in 25 (10.91%) HCWs. Symptoms suggestive of Type I latex allergy were reported in 11 (4.8%), while those of contact dermatitis were reported in 17 (7.42%) HCWs. Of the 229 HCWs, 37 (16.16%) had a personal history of atopy; 14 (6.11%) were SPT positive to latex allergen. Conclusions: In this study among Indian HCW, there was a significant correlation of latex glove-related symptoms with the duration of glove use, personal atopy, and SPT positivity to latex allergen. Questionnaire-based evaluation of allergic symptoms along with SPT positivity was found to be a useful identifier of true latex allergy. Introduction: Much as the techniques have progressed to make organ transplantations safe and effective, the legal and ethical tangle surrounding the process has necessitated strict regulations and protocols to be followed. This paper studies a cross-sectional survey conducted on 198 postgraduate residents from various specialties with the aim of determining awareness of (a) legal and ethical requirements, (b) organ donation possibilities, and (c) technical details including brain-death criteria. Methods: A cross-sectional survey was conducted among postgraduate residents of all specialties in a tertiary care teaching institution. The survey instrument was a questionnaire with multiple choice questions aimed at evaluating awareness of the residents in the three knowledge domains. The mean scores of residents from each specialty and groups of specialties with similar work exposure were calculated and compared, with statistical significance tested using the ANOVA. Results: There was no statistically significant difference between the year-wise mean scores between residents of 1st, 2nd, and 3rd years. No significant difference in scores was obtained between groups of residents from similar specialties. Scores obtained by residents of specialties routinely managing patients in intensive care unit did not show any statistically significant difference with year of training. There was significantly lesser score obtained by anesthesiology residents in the domain concerning the possibility of donation of specific organs compared with surgery residents. 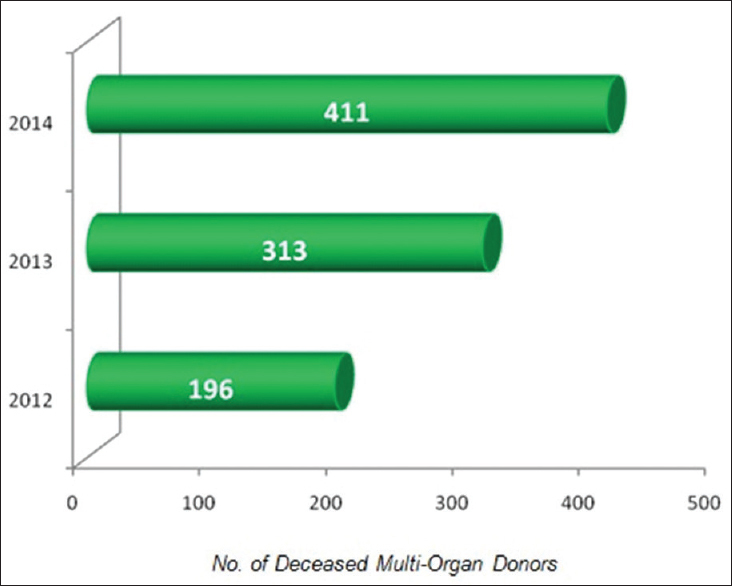 There were significantly high mean scores in the knowledge domain related to brain death criteria and transplant techniques for medicine and surgery residents, respectively. Conclusion: The low levels of scientific knowledge regarding organ donation protocols and associated legalities among resident doctors are a matter of concern. These findings may merit consideration to include these protocols as part of teaching curriculum. Background: Young male adults wishing to join armed forces have to comply with age-matched height and weight standards. Aim: This study aimed to examine the dietary changes adopted by young male adults declared overweight at initial medical examination. Settings and Designs: This was a cross-sectional observational study of candidates reporting for Appeal Medical Board (AMB). Materials and Methods: Nutrient information was collected using a 24-h semiquantitative food frequency questionnaire for food intake both before being declared unfit and before appearing for AMB. Calorie intake and macronutrient consumption were calculated using the Indian Council of Medical Research charts. Statistical Analysis: Microsoft Excel 2016 was used to analyze sample frequencies, percentage, mean (± standard deviation), and median (range), and paired t-test was used for comparing pre- and postdata. Results: Twenty-five male candidates participated in this study. They had reduced weight by a mean of 6.5 ± 2.7 kg by reducing caloric intake from 2884 ± 587.8 kcal to 1624.4 ± 327 kcal. 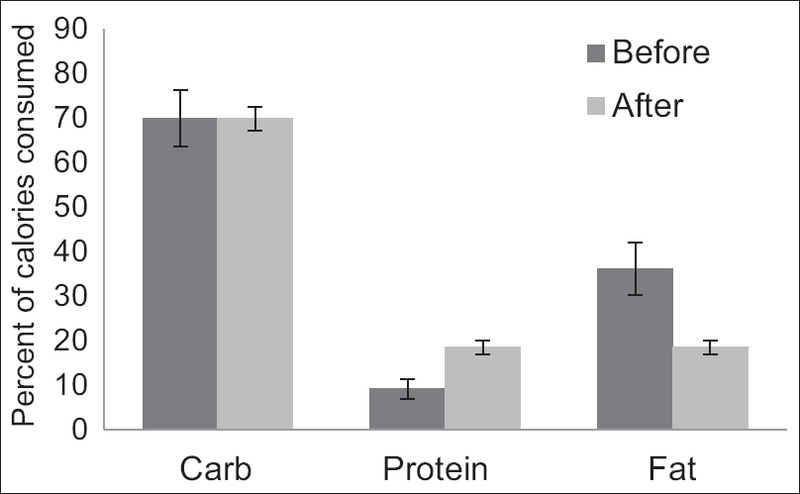 The daily intake of carbohydrates was reduced from 510.2 ± 120.7 to 284.2 ± 67.0 g and fats from 60.46 ± 14.06 to 20.3 ± 3.0 g, whereas protein intake was increased from 64.4 ± 10.7 to 74.6 ± 11.8 g. The candidates had switched to a diet containing fruit, vegetable salad, mung dal, and oatmeal. Amount of calories expended by exercise was approximately 350 kcal/day. Majority had sourced the Internet for information. Conclusions: Young male adults being made unfit for overweight during initial medical examination reduce weight by adopting a low-fat diet. Background: Nasolacrimal duct (NLD) obstruction is a common clinical entity encountered both by ophthalmologists as well as otorhinolaryngologists. Endoscopic dacryocystorhinostomy (DCR) has emerged as a gold standard surgery for treatment of this disorder. Silicone stents are often promoted as agents to maintain patency of surgically created fistula during postoperative period in this surgery. Aim: The aim of this study is to evaluate and compare the outcomes of endoscopic DCR with and without silicone stenting. Materials and Methods: A prospective observational study was conducted. 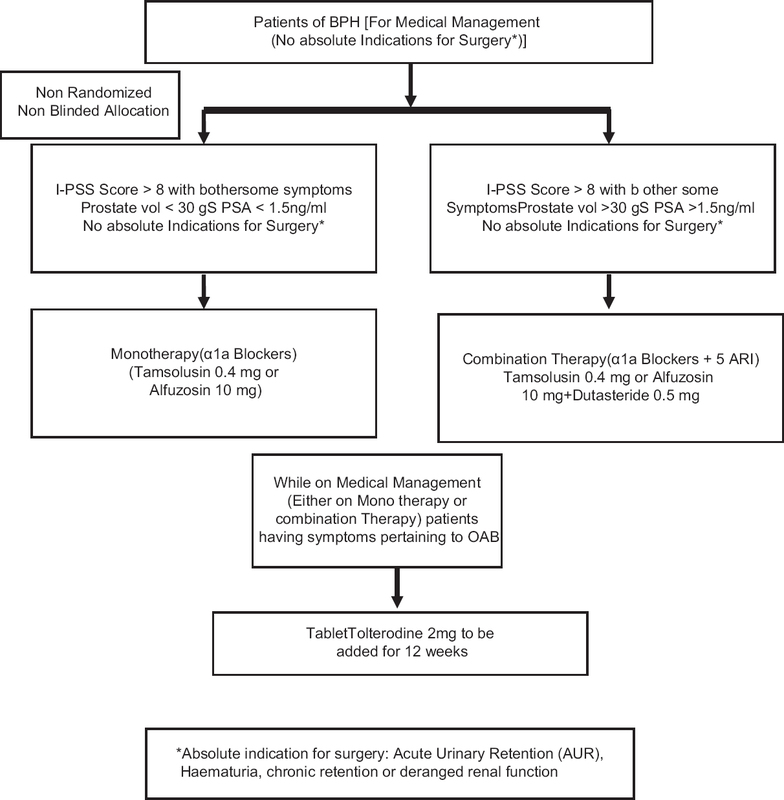 Totally 50 patients with acquired NLD obstruction were enrolled in the study and were randomly assigned to two groups: Group I underwent the surgery with silicone stent placement while the Group II underwent the surgery without stent placement. The patients were evaluated in terms of relief of symptoms and postoperative complications. Results: The overall success rate for endoscopic DCR in this study was 90% which is comparable with the reports in the literature. Success rate for patients with placement of stent was 92% and without stenting was 88%. However, there was no significant statistical difference between the two groups. 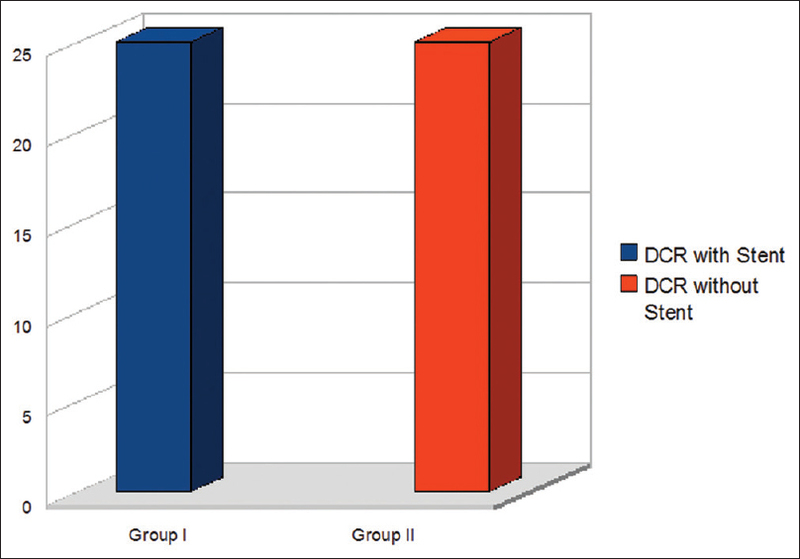 Conclusion: Use of silicone stents does not influence results of Endoscopic DCR. Introduction: Outbreaks of mumps are known in places of high population density because of close contact. Studies on mumps outbreak in adults have rarely been documented in India, although globally an epidemiological shift is noticed in the disease from children to young adults because of vaccination against the disease in childhood. 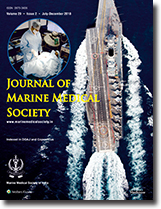 Materials and Methods: This outbreak investigation was conducted at a sailor training center of the Indian Navy. 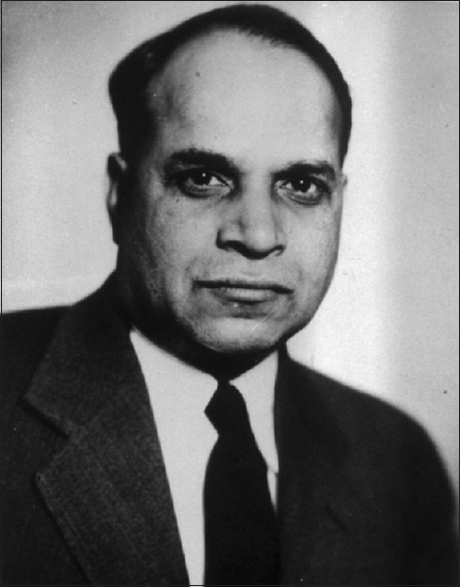 All cases of fever with parotitis, orchitis, or features suggestive of mumps were included in the study. The clinical, epidemiological, and demographic data of all the positive cases were analyzed using a standardized questionnaire and review of medical records. 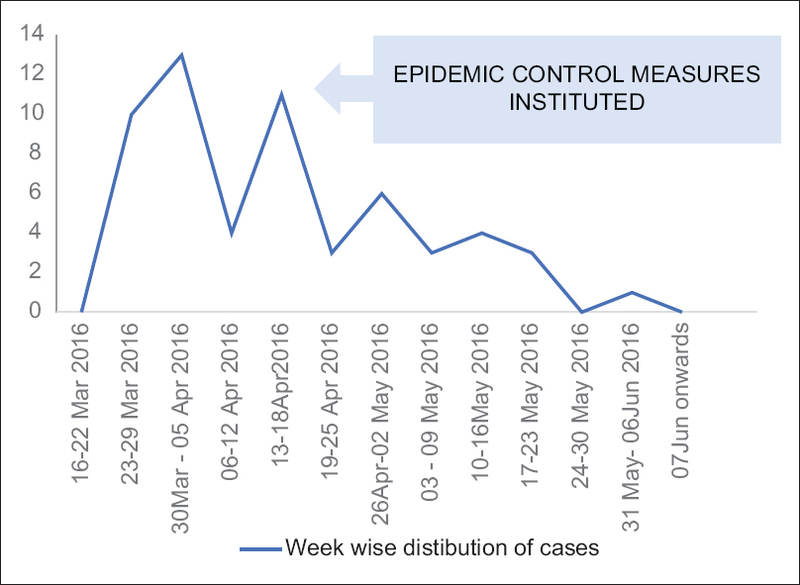 Results: A total of 58 cases reported over 3 months. Forty-two cases were from a single division and 13 cases from the same dormitory as the index case. Parotitis (89.7%) was the most common presentations, and orchitis (13.8%) was the most common complication. The attack rate (AR) within the division was 15.46%, with overall AR of 2.32%. The incidence was 23.2 per 1000 per year. Case fatality rate of the disease was nil. Recommendations: Surveillance, early diagnosis, and prompt isolation remain the key to prevent the transmission of illness during an outbreak. Other preventive measures include health education of recruits and their instructors. Intravenous (IV) fluid resuscitation, pioneered in 1832, is now one of the most common medical interventions in hospitalized patients. Up until the end of the 20th century, IV fluid prescriptions have been considered ancillary, benign interventions and rarely tested in good-quality randomized clinical trials (RCTs). Robust clinical research evidence emerging in the past decade and a half, however, has revealed counterintuitive findings. The emerging research has consistently demonstrated harm, including higher mortality, and questionable clinical benefits associated with protocolized aggressive fluid resuscitation, as espoused in the early goal-directed therapy. Conservative fluid management has been shown to be associated with better outcomes in most clinical settings. Recent RCTs have also revealed clinically relevant pharmacological differences between types of IV fluids, especially pertaining to predictable harms associated with some commonly used IV fluids. Concerns have emerged over risks of metabolic acidosis and renal failure associated with the use of normal saline. Balanced solutions have been found to be safe across a wide spectrum of conditions. 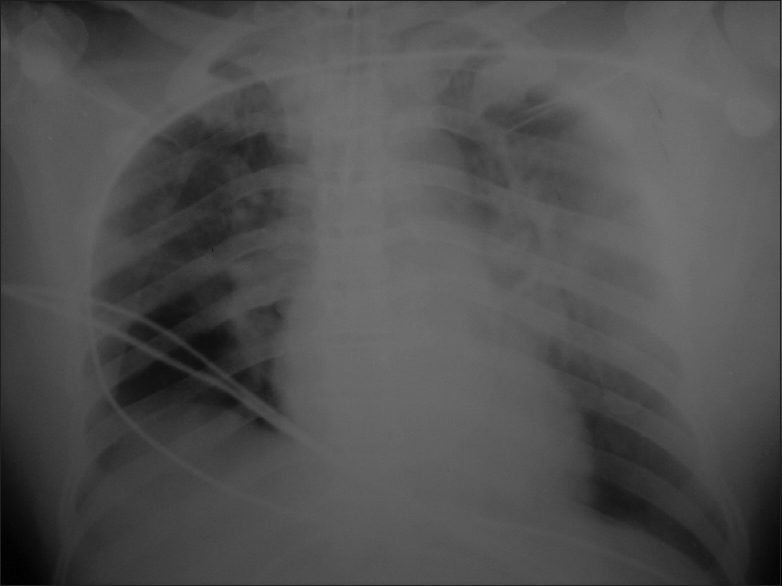 Better understanding of the complex pathophysiology of sepsis and critical illnesses and recognition of newer concepts such as profound disruption of the endothelial glycocalyx layer leading to profound leakiness of vessels question the basic premise of injection of large quantities of IV fluids during resuscitation. Small bowel tumors are rare, accounting for <5% of gastrointestinal neoplasms, 1%–2% of these being malignant. The most common histological subtype is adenocarcinoma. Small bowel adenocarcinoma (SBA) is challenging to diagnose, often presents at a late stage, and has a poor prognosis. Therefore, a high index of clinical suspicion is required to diagnose such patients, and a better outcome with early-stage detection is expected. We report here two cases of jejunal adenocarcinoma. (a) A 53-year-old male presenting with iron deficiency anemia. (b) An 81-year old-female presenting with subacute intestinal obstruction. Diagnosis of SBA remains a challenge. A physician's suspicion and awareness are crucial in such patients. The early diagnosis will affect overall survival and mortality rate. Because the incidence of SBA is very low, there is a need for further studies to evaluate the possible application of newer investigative agents and strategies to obtain a better outcome. Osseous choristoma of the eye is a rare entity with few case reports being published in the literature. We report one such case in a 14-year old female who had a small growth in the right eye present since birth, which gradually increased in size. Excision biopsy was done. Histologically, the mass was composed of mature bone with surrounding benign adipocytes. Hysteroscopic gynecological surgeries are now commonly employed in the clinical practice. It has the potential to increase morbidity due to the complication resulting from perforation of the uterus, air/gas embolism, and fluid with electrolyte imbalance. Glycine 1.5%, as an irrigating fluid, is being commonly used and on increased systemic absorption can lead to a wide array of complications. 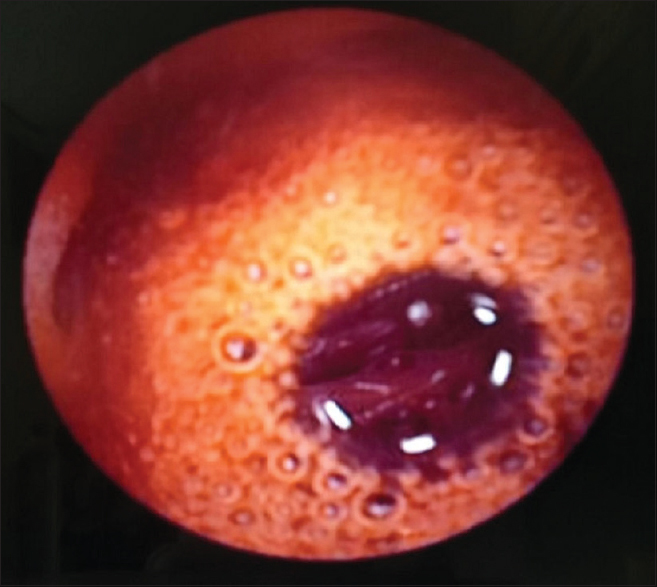 We present a case of transient visual loss after increased absorption of the irrigating fluid, thereby highlighting the factors governing in its genesis and prevention. Spontaneous cerebrospinal fluid (CSF) rhinorrhea in an adult without prior history of head trauma is a rare occurrence. Neuroimaging is done to ascertain the site of bony defects in the cranium and breach in the continuity of dura to localize the site of CSF leakage. 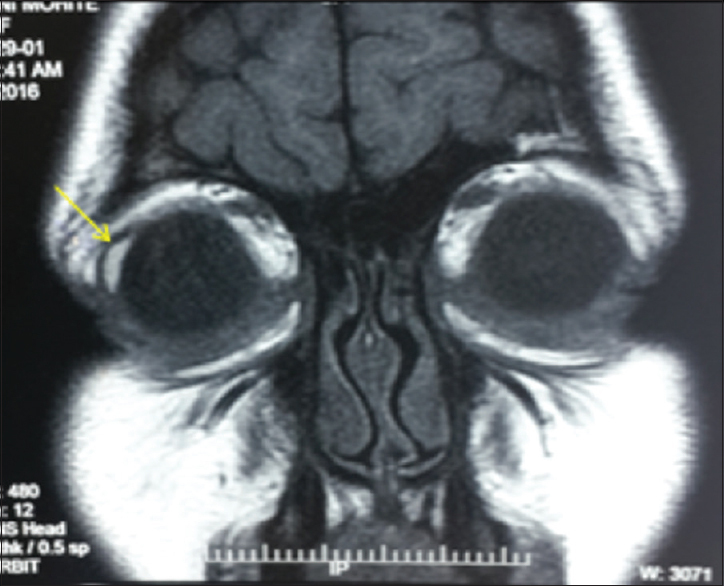 Encephaloceles into the sphenoid sinus occurring through congenital bony defects in the walls of the sinus are an extremely rare cause for CSF rhinorrhea. 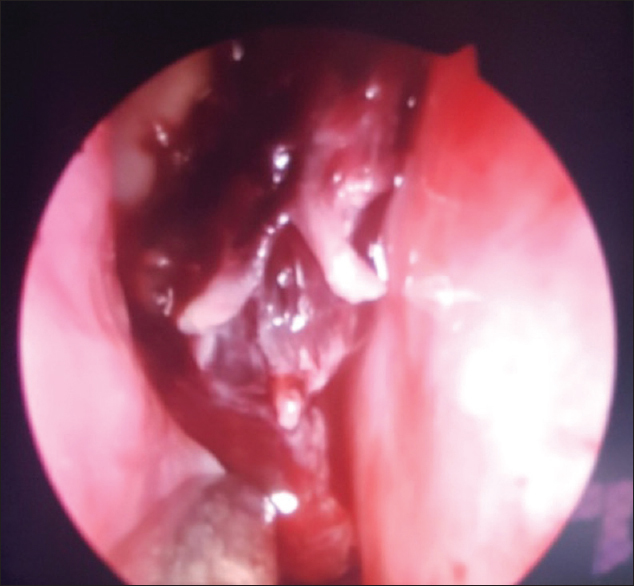 We present a case of spontaneous, nontraumatic CSF rhinorrhea due to an anteromedial encephalocele where the temporal lobe was seen herniating into the right sphenoid sinus through a congenital bony defect in the wall of the sinus. A review of the present literature is also presented. H1N1 influenza A was responsible for global pandemic in 2009. Since then H1N1 continues to be responsible for epidemics frequently. H1N1 influenza causing organizing pneumonia (OP) is extremely rare, and only 6 cases have been reported till date. Here, we report a case of H1N1 presenting as an OP. 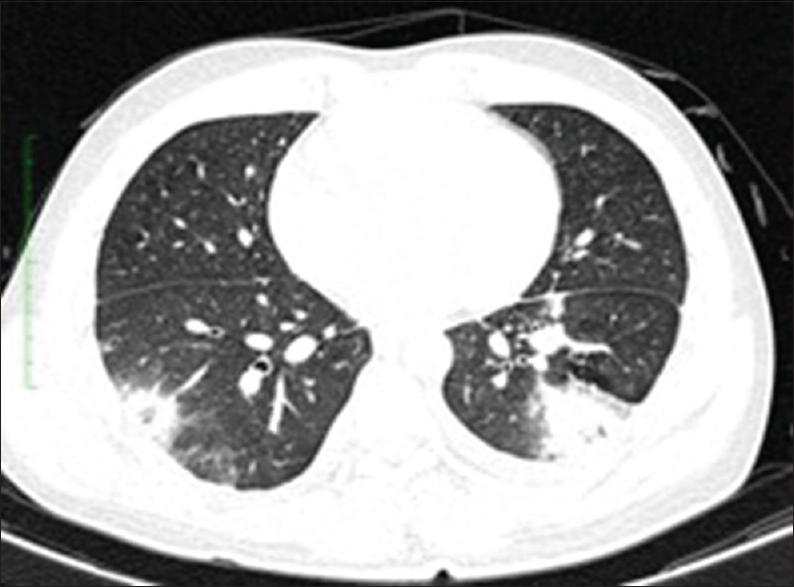 The significance of diagnosing OP in appropriate clinical and radiological setting is being highlighted along with its prompt response to treatment. Pituitary apoplexy is a rare condition more often seen in large pituitary adenomas. It is preceded by an abrupt expansion of infarcted/hemorrhagic pituitary adenoma extending into the cavernous sinus or superiorly compressing the optic chiasm. An invasive pituitary tumor extends into the suprasellar cistern by stretching and fenestrating the diaphragma sellae and arachnoids layer. It is labeled as invasion of the cavernous sinus when the percentage of encasement of the internal carotid artery by the tumor is 67% or greater or for Grade 3 or 4 of Knosp classification. A 51-year-old male presented with headache, vomiting, and bleeding from the nose for 3-day duration and blurring of vision for 2-day duration. Contrast-enhanced magnetic resonance imaging of the brain revealed an enhancing sellar and suprasellar lesion with characteristic expansion into the cavernous sinus and extension into the sphenoid sinus and nasopharynx. The patient underwent endoscopic transnasal transsphenoidal excision of the mass followed by three-dimensional conformational radiotherapy and hormone replacement therapy with a favorable clinical outcome. Intrauterine Contraceptive Devices (IUCD) are commonly used in India as a means of contraception. It is a safe, effective and economical method. The complications include menorrhagia, expulsion, migration and ectopic pregnancy. Displaced IUCDs after uterine perforation can be located at many sites like pelvis, adnexa, bowel, bladder, abdominal cavity. They can have an unusual presentation. They require surgical removal preferably laparoscopically, although conversion to open surgery especially in abdominal cavity is quiet common. Here we present a case which had an unusual presentation and was found close to umbilicus embedded in omentum. The IUCD was successfully extracted out laparoscopically. Acne fulminans (AF) is a rare yet the most severe inflammatory form of acne. It predominantly affects prepubertal boys in the form of multiple exuberant pustular and ulcerative lesions over the face and trunk associated with systemic symptoms in the form of fever, polyarthralgia, and osteolytic bone lesions. In spite of multiple mentioned triggering agents, till date, no direct cause has been ascertained. Drugs like isotretinoin for acne and anabolic steroids are known to precipitate this condition. Due to systemic symptoms, the patient may sometimes require an aggressive inpatient treatment to prevent any systemic complications and grossly morbid scarring as a result of the disease. 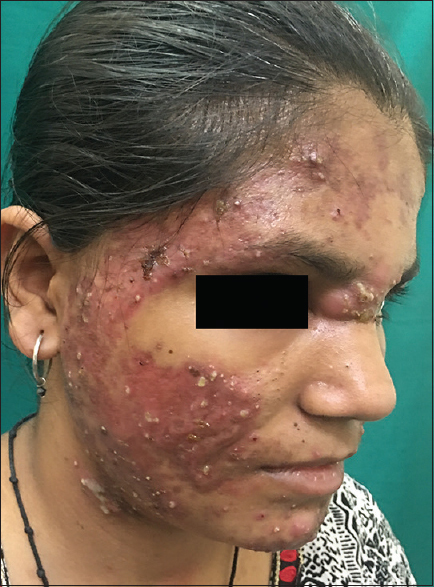 Herein, we report a rare case of AF in a 16-year-old female with predominantly facial involvement who was managed with oral corticosteroids and isotretinoin with excellent response.